Newly published free to read article Paediatric antidepressants: Benefits and risks on over medication of antidepressants to children will be featured in the BBC documentary series “The Doctor Who Gave Up Drugs”. 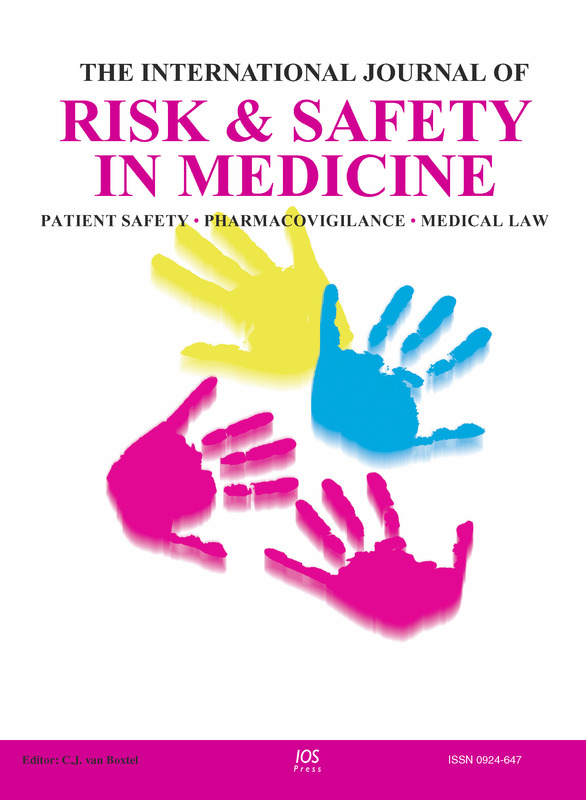 The International Journal of Risk and Safety in Medicine is concerned with rendering the practice of medicine as safe as it can be; that involves promoting the highest possible quality of care, but also examining how those risks which are inevitable can be contained and managed. This is not exclusively a drugs journal. Recently it was decided to include in the subtitle of the journal three items to better indicate the scope of the journal, i.e. patient safety, pharmacovigilance and liability and the Editorial Board was adjusted accordingly. For each of these sections an Associate Editor was invited. We especially want to emphasize patient safety. Our journal wants to publish high quality interdisciplinary papers related to patient safety, not the ones for domain specialists. For quite some time we have also been devoting some pages in every issue to what we simply call WHO news. This affinity with WHO underlines both the International character of the journal and the subject matter we want to cover. Basic research, reports of clinical experience and overviews will all be considered for publication, but since major reviews of the literature are often written at the invitation of the Editorial Board it is generally advisable to consult with the Editor in advance. Submission of news items will be appreciated, as will be the contribution of letters on topics which have been dealt with in the journal. Submission of an article is understood to imply that the article is original and unpublished and is not being considered for publication elsewhere. 3 to 5 Keywords should be added. (1) Associations with commercial entities that provided support for the work reported in the submitted manuscript (the timeframe for disclosure in this section of the form is the lifespanof the work being reported). (2) Associations with commercial entities that could be viewed as having an interest in the general area of the submitted manuscript (in the 36 months before submission of the manuscript). (3) Any similar financial associations involving authors’ spouses, partners, their children under 18 years. (4) Non-financial associations that may be relevant to the submitted manuscript. For research, statements are needed regarding ethics approval (or a statement that it was not required) and of seeking informed consent from participants; funding; the role of the study sponsor in study design and the collection, analysis, and interpretation of data and the writing of the article and the decision to submit it for publication; the independence of researchers from funders and sponsors; and the access of researchers to all the data. 1. Place citations as numbers in square brackets in the text. All publications cited in the text should be presented in a list of references following the text of the manuscript. Only articles published or accepted for publication should be listed in the reference list. Submitted articles can be listed in the text as (author(s), unpublished data). 2. All authors should be listed in the reference list. Rose ME, Huerbin MB, Melick J, Marion DW, Palmer AM, Schiding JK, Kochanek PM, Graham SH. Regulation of interstitial excitatory amino acid concentrations after cortical contusion injury. Brain Res. 2002; 935(12): 406. Canadian Cancer Society [homepage on the Internet]. Toronto: The Society; 2006 [updated 2006 May 12; cited 2006 Oct 17]. Available from: http://www.cancer.ca/. For each contribution the corresponding author will receive a complimentary Author’s Copy (watermarked) pdf of their published article. This pdf is for personal use only. Free copies will not be provided for conference proceedings and abstract issues. An order form for reprints, additional journal copies or a pdf file will be provided along with the pdf proof. If you wish to order reprints of an earlier published article, please contact the publisher for a quotation. IOS Press, Fax: +31 20 6870039. Email: editorial@iospress.nl.